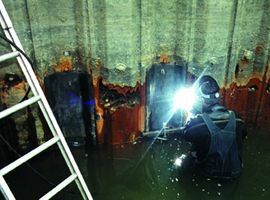 Understanding the electrolytic corrosion mechanism at work on steel piles immersed in salt water is essential before a repair method is chosen. Many patch up jobs on steel sheeting actually accelerate the corrosion problem. Hudson Marine performs repairs that last. The ability to work above and below waterline has saved our clients thousands of dollars by avoiding costly bulkhead replacement.